Today is the New York Marathon and I watched the race on TV after my run on the bike trail at Bethpage. It was an exciting finish for the women, with Dado overtaking Keitany's lead in the last miles through Central Park. On Friday, I made my annual pilgrimage to the NYC Marathon Expo at the Javits Center and brought along KWL who had never attended it. The Expo was even more overwhelming this year than last and I saw Dean Karnazes and met Marshall Ulricht, whose book "Running on Empty" I'd recently read. It was amazing to talk to this man who set records for running across America, starting in San Francisco and finishing in New York 52 days later. 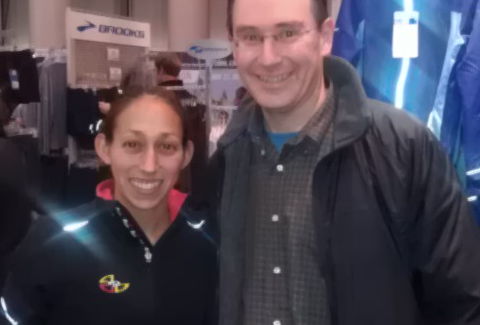 I also met Desi Davila, who finished second in this year's Boston Marathon and holds the fastest women's time ever in that race. Desi was sweet and humble, I mentioned the cover story about her in Running Times and she just smiled and nodded. She told me she was skipping the NYC marathon because she's training for the 2012 Olympics. I will be rooting for her to make the team! Today I took advantage of the Daylight Savings Time roll-back and got out early for my run. I planned to take it easy so I could benchmark my condition and see how ready I am for a 10K next Sunday. It was chilly and I wore layers and gloves and I felt pretty good for the first four miles. At around the five mile point I started feeling some weakness. I'm thinking that my base has probably slid back to about 4 miles since Cow Harbor. I slowed down a little to get past a hilly section and tried not to think about the last mile that is the toughest part of the return leg. By mile six I felt similar to how I'd felt near the end of my half marathon, my spirit was willing but my legs were not. I told myself "just keep going" and I did, although I'm not sure how I managed to get over that final hill. I may not run the Race for the Warriors next weekend because (as of right now) I don't feel prepared to run a competitive 10K. I guess I can run it as a training exercise for the Long Beach Turkey Trot the following week. I'll decide that in the next day or so. I'm hoping that my experience today had more to do with having a slight chest cold than the fact that my conditioning isn't where it needs to be right now.